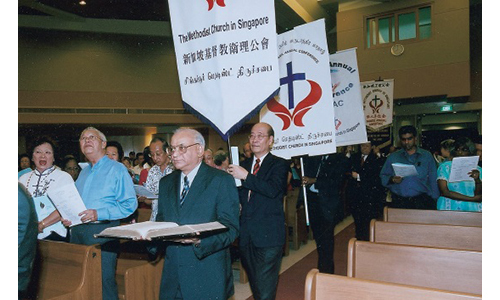 THE METHODIST CHURCH IN SINGAPORE (MCS) faces three challenges today as it celebrates its 125th Anniversary. • Widen and deepen our mission that should be engaged in by all Methodists. 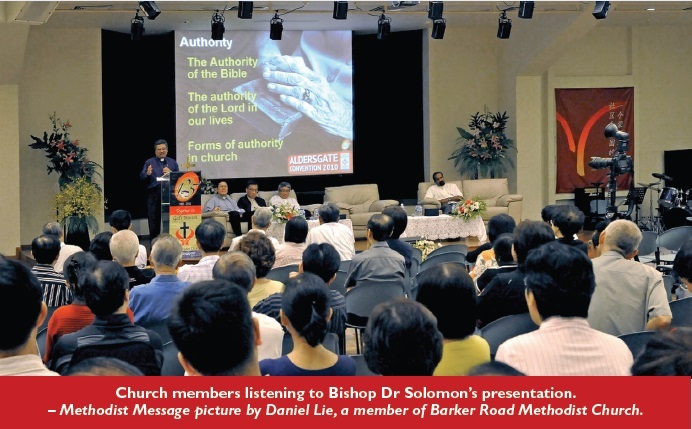 This was stated by Bishop Dr Robert Solomon when he was rounding off the presentations at a Dialogue he and the three Annual Conference Presidents held with the Methodist family at Paya Lebar Methodist Church on May 21. Touching on the implications for the MCS now and in the future, he said the issue of authority would be a growing challenge. We have to safeguard the authority of the Bible; we have to manifest the authority of the Lord in our lives; and we have to consider what forms of authority we should have in the church – for example, Can the church be fully democratic? Is that the biblical way? On connectionalism, he asked whether we should re-organise ourselves to strengthen our connection so as to function more effectively, and how we should effectively keep and disciple the next generation. As for our mission, he wondered what steps we should take in the coming years, for example, how should we reach out to new Singaporeans such as migrant workers, expatriates and Permanent Residents. The Dialogue was a no-holds barred session, and the 300 or so pastors and church leaders who turned up went home happy and satisfied given the time and circumstances in which it was held. It was the first Dialogue of its kind to be held. The panel speakers dealt with topics based on the theme of the 125th Anniversary of The Methodist Church in Singapore (MCS), “Together in God’s Mission”. Those who came were only disappointed that the session, which started at 7.30 pm and ended at 9.45 pm, was too short. The moderator, the Rev Dr Ngoei Foong Nghian, Chairman of the Council on Communications, took questions from the floor, and they were answered by the panel. The first speaker, the Rev Dr Chong Chin Chung, who dwelt on the topic being Together”, plunged head-on into the importance of forging “Togetherness” in the ministry and life of the MCS. Speaking in Mandarin, the Rev Dr Chong, who is the President of the Chinese Annual Conference, referred to the May 2010 issue of the Episcopal Letter in which, he said, the Bishop’s “clear expounding of the meaning of ‘togetherness’, with its scriptural basis, as well as the exhortation to all in the Methodist family, is inspiring reading”. He touched on the lack of support given to events organised by the Annual Conferences or the General Conference. He pointed out that pastors and leaders participate enthusiastically in the affairs of their local church because they feel connected with their own church and they identify with their work. In the second talk, the Rev James Nagulan, President of Emmanuel Tamil Annual Conference, looked at the Word “God’s” in the theme “Together in God’s Mission”. He said that mission in every sense of the word is the work of God amongst His people. 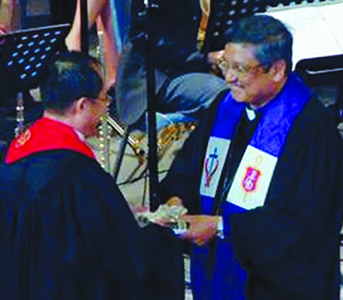 Said the Rev Nagulan: “We are pleased that God has blessed us with such rich resources in the Methodist Church. When we avail ourselves to God and His Spirit to teach and guide us we will begin to see the witness of the Holy Spirit in our own lives and the Methodist Church. The third speaker, Trinity Annual Conference President Rev Dr Wee Boon Hup, emphasised that every follower or disciple of Christ is “sent off on a mission”. This sending is not to places, as is often thought of in world missions, he said. It is sending to the various conditions or situations of things in this world and into the lives of people. It is a sending not to a geographical place, but to the various worlds in which we live. “For example, the world of the migrant construction worker is different from the world of the domestic helper. The world of the middle-class Singaporean corporate banker is different from the world of professional artiste, musician or person who works in the entertainment industry. Every industry is in fact a different world. Mission, therefore, is not just the work of people who are professional in missions, like pastors, full-time workers, church staff, and missionaries, nor only the concern of people elected to serve in the leadership of the local church or agencies. “Every disciple of Christ is sent off on a mission. In today’s context, when we neglect to instil into every believer that wherever he is sent, he is there on a mission from God, we have wiped out the largest missionary force on earth, the ordinary believers in Christ,” added the Rev Dr Wee. MRS DOROTHY WONG of Wesley Methodist Church found the Dialogue “thoroughly informative, especially the talk and input by the Bishop”. The session aroused her thoughts on certain issues that the Methodist Church is facing today, she said. Mr John Ang of Paya Lebar Chinese Methodist Church described the Dialogue as “a good start to discussing issues in a more focused manner”. 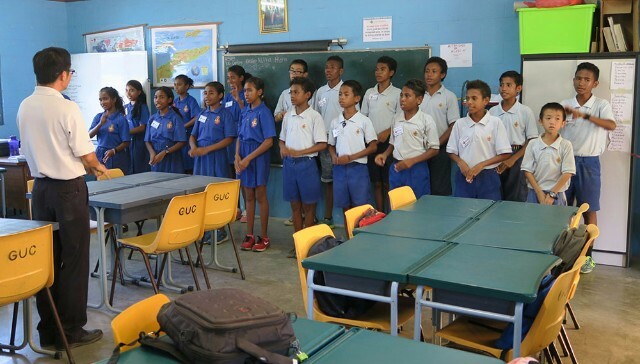 “I’m glad that we focused on the three topics as defined in our 125th Anniversary theme. I think it would have been even more beneficial if we had focused on each of the three topics at separate times so that there could be a more in-depth discussion. Still, this is a good start.” The Vice-President of Emmanuel Tamil Annual Conference (ETAC), Mr Shadrak Stephen, said: “It was a very useful session. A PERSONAL BIBLE of Mr John Polglase, the first member of the early Methodist Church in Singapore 125 years ago, has been given to The Methodist Church in Singapore (MCS). The Rev Malcolm Tan, Chairman of the Council on Archives and History, presented the Bible on behalf of the Polglase family to Bishop Dr Robert Solomon during the Combined 125th Anniversary anksgiving and Aldersgate 2010 Service at Paya Lebar Methodist Church on May 22 (picture at above). Two of Mr Polglase’s grandchildren, Mr Ian McLeod and Dr Denise Sherwood, brother and sister, who are unable to travel, donated his personal Bible to the MCS. Together with the Bible is a copy of Mr McLeod’s biography of his mother, Dorothy, entitled I will Sing to the End. Dorothy was Mr Polglase’s daughter who taught for a number of years at Anglo-Chinese School and who died of malnutrition in a prisoner-of-war camp on Bangka Island on Easter Sunday, 1945. The Bible and the biography will be deposited at the Methodist Archives and History Library and displayed as some of our historic artefacts. Mr Polglase was a one-man organiser and facilitator who worked with the Rev William Oldham and provided valuable support for the early Methodist Mission. 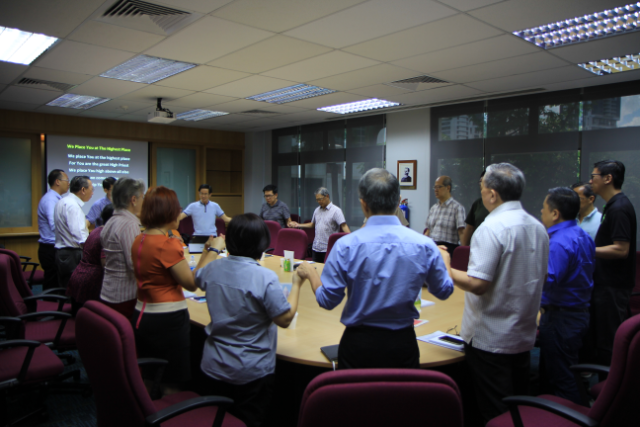 – Methodist Message picture by Phillip Lam, a member of Geylang Chinese Methodist Church. 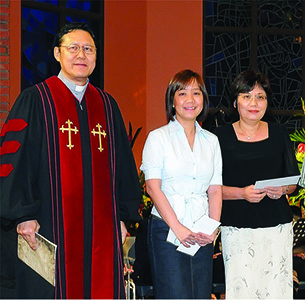 MS GWENDOLYN TAN, a member of Barker Road Methodist Church, and Ms Shirley Koh of Bedok Methodist Church (above centre and right) with the Rev Dr Ngoei Foong Nghian, Chairman of the Council on Communications, after receiving their cash prizes from Bishop Dr Robert Solomon for their winning designs in the 125th Anniversary Logo Competition organised by The Methodist Church in Singapore (MCS) in August last year. Ms Tan won the top prize of $500, while Ms Koh won the commendation prize of $200. Mr Abel Amir of Jurong Tamil Methodist Church was the other winner of the commendation prize of $200. 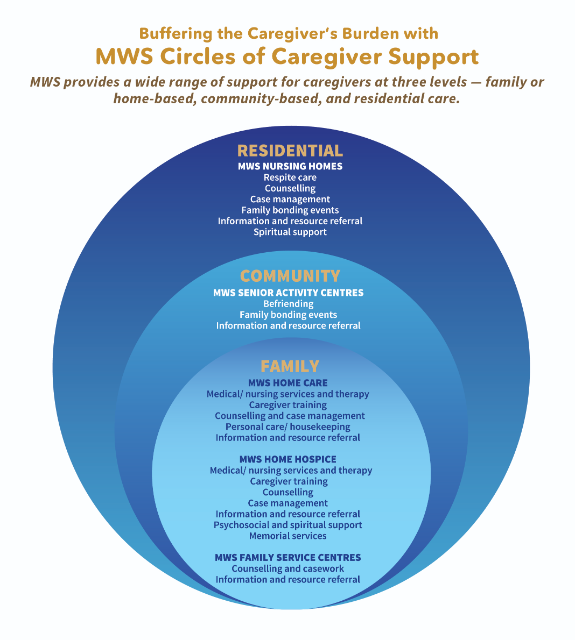 Ms Tan’s logo, seen in this Newsletter, is being used in all publicity materials of the MCS throughout this year. – Methodist Message picture by Daniel Lie.